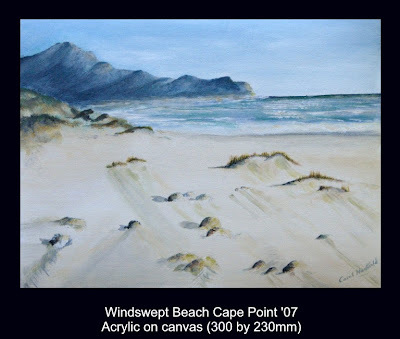 A Windswept Beach in the Cape Point Nature Reserve. My first ever entry into a photographic competition (Sunday Argus) and I am a runner up! My word what a surprise! Here is the picture I entered. The big problem is that the competition organisers will only take photo's that are 1 MB or more and I have a baby camera that does not take photos that size. I don't know if they will accept any more entries from me. I will be e mailing them to ask. When the competition started the weekly prize was a weekend away, which I was after, but they seem to have stopped that and now give away a dinner for two at the Blowfish Restaurant. Perhaps they should give a camera as a prize instead of the dinner for two! Funnily enough only last week I finished a painting of the very same photograph! Here is a photograph of the painting.